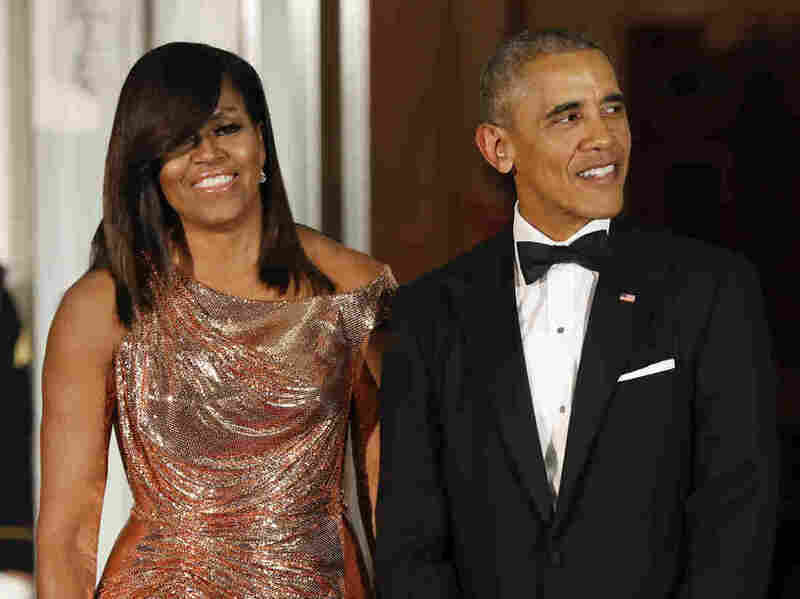 Obamas Sign Deal With Netflix, Form 'Higher Ground Productions' : The Two-Way A deal involving the former president and first lady and the streaming powerhouse has been reached. Netflix says the Obamas' company will produce docu-series, documentaries and features. President Barack Obama and first lady Michelle Obama wait to greet Italian Prime Minister Matteo Renzi and his wife, Agnese Landini, for a State Dinner at the White House in Washington in 2016. Netflix says it has reached a deal with the Obamas to produce material for the streaming service. "Michelle and I are so excited to partner with Netflix – we hope to cultivate and curate the talented, inspiring, creative voices who are able to promote greater empathy and understanding between peoples, and help them share their stories with the entire world," the former president said in the Netflix statement. Worldwide, Netflix has 125 million subscribers. According to Variety, "It is unknown how much the Obamas' Netflix agreement ... is worth. In March, Penguin Random House signed the couple to a joint book deal that pays them a reported $65 million for their respective memoirs." Rumors of the deal first surfaced in March in The New York Times. At the time, the newspaper reported that the former president did not intend to use the shows produced "to directly respond to President Trump or conservative critics," but instead to produce "shows that highlight inspirational stories." "The Obamas can be expected to participate in some of the programming onscreen, said a person familiar with the deal, not authorized to talk publicly about it, on condition of anonymity. ... The type of people that Obama — like other presidents — brought forward as guests at his State of the Union addresses would likely provide fodder for the kinds of stories they want to tell."